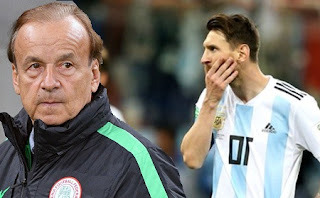 Super Eagles technical adviser Gernot Rohr has declared that the Nigerian team will be merciless against the Lionel Messi-led Argentine side in the crucial Group D encounter in St. Petersburg Tuesday. While assuring that the Eagles will be all out for the maximum points, Rohr told sportswriters after the team’s first training at the venue of the encounter that there will be no mercy for Messi. He noted that though the entire world have been sympathetic to the former world footballer of the year, who is yet to get on the scorers sheet, Eagles will match the Argentines strength for strength. Rohr, who admitted that the South Americans are more experienced than his players, however, argued that the Eagles team is a composition of young talents ready to make a statement. He also assured that the errors in the two previous games that earned two penalties to Croatia and Iceland have been addressed, assuring that they will equally avoid committing free kicks around vital areas. “We understand that this match may be the last World Cup game for the Argentine captain, Messi. We are equally aware that the world will be sympathetic to him, but that will not deter us. “We are going to approach the game with every amount of seriousness and hopefully our young team will triumph over the more experienced Argentina. We will put in everything into the match,” he assured. Rohr also revealed that the Nigeria Football Federation (NFF) will appeal to FIFA to allow Super Eagles captain Mikel Obi to play with a cast on his hand because of the little fracture he had in the last game against Iceland. “There is no injury concern in the team. Mikel is also okay, but he is nursing a slight fracture he sustained during the game against Iceland. “He will likely play with a cast in his hand, but we will have to formally apply to FIFA to seek its permission to allow him play with the cast,” Rohr revealed.